A regular breeding resident and migrant throughout all but the very northern regions of the state. Regular in winter but not common; birds have been observed every winter since 1972, and some years before, dating back to 1922. Most winter birds are seen at feeders. The Brown Thrasher was a common species during the Minnesota Breeding Bird Atlas (MNBBA). Widely distributed across eastern North America, from southern Alberta east to southern Quebec and New Brunswick, and from the U.S. Great Plains states east to the Atlantic coast. The core of the species’ breeding range is south of Minnesota, in the central Great Plains and the southeastern United States (Figure 1). Assigned a Continental Concern Score of 10/20 by Partners in Flight; designated a Species in Greatest Conservation Need by the Minnesota Department of Natural Resources. A short-distance to partial migrant that winters in the southeastern United States. A ground forager whose diet consists primarily of arthropods but also includes berries, nuts, and waste grains. Occasionally gleans insects from foliage. Open-cup nest usually placed within vines, shrubs, or small trees usually less than 3 meters above the ground. Breeding distribution and relative abundance of the Brown Thrasher in North America based on the federal Breeding Bird Survey, 2011–2015 (Sauer et al. 2017). In thickly forested regions it seeks the more open places and clearings, avoiding the heavy timber. Every patch of woodland out on the prairies has its pair or more of Thrashers. Nesting was confirmed (nests with eggs or young) from Rock and Lac qui Parle Counties in southwestern Minnesota, from Hennepin County in central Minnesota, from Polk and Marshall Counties in the northwest, and from Cass Lake in north-central Minnesota. Inferred breeding evidence (i.e., adults feeding young and/or a nest without eggs) was documented in Goodhue County, Itasca County, and Itasca State Park. Many years later, Green and Janssen (1975) noted that thrashers were largely absent from the extensively forested landscapes of northern Minnesota. When present, they were found in forest openings created by timber management activities but appeared to be absent from natural forest openings. A few years later, however, Niemi (1978) documented that Brown Thrashers were common on the Little Sioux burn two to four years following the May 1971 fire that burned nearly 15,000 acres. Janssen (1987) delineated 34 counties where nesting had been confirmed since 1970; records occurred in all regions of the state. A few years later, Hertzel and Janssen (1998) added another 7 counties to the list. Field biologists with the Minnesota Biological Survey have documented 416 Brown Thrasher breeding season locations (Minnesota Department of Natural Resources 2016). Although they were found statewide, the birds were least common in the Laurentian Mixed Forest Province, and most common in the southern half of the Prairie Parkland Province. During the MNBBA, participants reported 2,091 thrasher records in 29.5% (1,402/4,757) of the surveyed atlas blocks and in 42.5% (993/2,337) of the priority blocks. Breeding evidence was documented in 166 of the surveyed blocks (Figures 2 and 3; Table 1). The species was observed in all 87 Minnesota counties and was confirmed nesting in 62 counties (1 block straddled 2 counties: Marshall and Pennington); 34 counties were additions to the list published by Hertzel and Janssen (1998). The Brown Thrasher was most common in the southern two-thirds of the state, from Lake Mille Lacs southward, and was least abundant in the Laurentian Mixed Forest Province. Atlas data were used to generate a model to predict the breeding distribution of Brown Thrashers statewide (Figure 4). The lowest probability is predicted in the far northeastern and north-central counties of the Laurentian Mixed Forest Province, especially in Cook and Lake Counties. Elsewhere in the province they can be found in the deciduous woodlands farther south and west and in developed areas, such as the Iron Range. They are predicted to be of moderate density elsewhere throughout the state with the exception of the southeastern Blufflands Subsection, where they are uncommon. Over the past 100 years, the Brown Thrasher’s distribution appears relatively unchanged. It is likely more abundant in counties on the southern edge of the Laurentian Mixed Forest Province than it was in the early 1900s. The landscape’s extensive stands of mixed deciduous and coniferous forests have been replaced in many areas with towns and cities, industrial development, and intense recreational development, creating a more open landscape suitable to the shrub-loving thrasher. Yet, as Niemi’s (1978) work on the Little Sioux fire demonstrated, the species may have been widespread in this forested landscape before fire suppression efforts became commonplace. Historically the Brown Thrasher is within a suite of species dependent on shrublands and open woodlots that benefited from wide-scale forest clearing and settlement in the eastern deciduous forest in the late 1800s and early 1900s. Farther west, in the Great Plains, it was originally confined to shrubby riparian corridors, but woody plantings along fencerows, shelterbelts, and farmsteads also provided expanded opportunities. More recently, in the latter half of the 20th century, Brown Thrashers have expanded into Canada’s Maritime Provinces and into southern Florida (Cavitt and Haas 2014). No significant distributional changes have been documented in the Upper Midwest and Great Lakes region. Breeding distribution of the Brown Thrasher in Minnesota based on the Breeding Bird Atlas (2009 – 2013). Summary statistics of observations by breeding status category for the Brown Thrasher in Minnesota based on all blocks (each 5 km x 5 km) surveyed during the Breeding Bird Atlas (2009-2013). Summary statistics for the Brown Thrasher observations by breeding status category for all blocks and priority blocks (each 5 km x 5 km) surveyed during the Minnesota Breeding Bird Atlas (2009-2013). Predicted breeding distribution (pairs per 40 hectares) of the Brown Thrasher in Minnesota based on habitat, landscape context, and climate data gathered during the Minnesota Breeding Bird Atlas (2009-2013) using the General Linear Modeling method with an adjustment for detectability. Few studies have examined the species’ breeding season requirements. Bent’s description almost 70 years ago still serves as a comprehensive description of the range of habitats thrashers find suitable (Bent 1948). He characterized the species as an inhabitant of the “rural, woodland and farming districts.” In the East it was commonly associated with overgrown pastures, dry thickets, and forest edges (Figure 5). In the West it was associated with fencerows, farmstead shelterbelts, and “woody draws.” Frequently seeking the dense and tangled cover of shrubs or low-growing trees, Brown Thrashers are often spotted only when they sing from a high perch above the shrubby growth or when they are flushed from the ground where they are foraging and quickly disappear to seek refuge in adjacent cover. During the breeding bird atlas in Wisconsin, Thrashers were observed in shrubby habitat in more than half of the atlas blocks where they were reported (Cutright et al. 2006). This corroborated an earlier description of the species’ preferred habitat in the state as “dry upland brushy habitat” (Robbins 1991). In forested landscapes, Brown Thrashers seek out the open, brushy clearings or dense, young growth of early successional stands. Data collected by the National Forest Bird (NFB) Monitoring Program on the four national forests in northern Wisconsin and Minnesota showed a strong association with open, dry habitats (Niemi et al. 2016). Habitat data collected within 200 m of MNBBA point counts where Brown Thrashers were detected demonstrated a strong correlation with croplands, grasslands, and development (Figure 6). Typical breeding habitat of the Brown Thrasher in Minnesota (© Gerald J. Niemi). Habitat profile for the Brown Thrasher based on habitats within 200 m of point counts where the species was present during the Minnesota Breeding Bird Atlas (2009-2013). Data gathered by the federal Breeding Bird Survey (BBS) have generated a global population estimate of 6.1 million breeding adults (Rosenberg et al. 2016). In 2013, Minnesota was estimated to support 2.4% of the continental population (Partners in Flight Science Committee 2013). Applying that percentage to the most recent continental estimate generates a statewide population estimate of 150,000 thrashers. This is considerably lower than the statewide population estimate derived using MNBBA point count data. Analyses of this larger data set resulted in a statewide population estimate of nearly 1.1 million adults (95% confidence interval of 872,000 to 1.3 million birds). Brown Thrasher breeding densities are highest in the central Great Plains states of Nebraska and Kansas (Figure 1). In Minnesota, BBS surveyors reported an average of 3 thrashers per BBS route from 1967 to 2015; in Kansas and Nebraska, observers reported an average of 9 birds per route (Sauer et al. 2017). A review of reported breeding densities across the United States by Cade (1986) demonstrated a wide range, spanning from a low of 0.7 males per 40 ha in herbaceous cover in Iowa to a high of 93.4 males per 40 ha in Illinois hedgerows. In northern forests of the Great Lakes region and New England, breeding densities ranged from a low of 2.0 males per 40 ha in Michigan’s mixed forests to 20.0 males per 40 ha in seedling and sapling conifer stands in New England (Cade 1986). The NFB Monitoring Program documented extremely low breeding densities on Minnesota’s two national forests. On the Chippewa there were only 0.01 pairs per 40 ha; on the Superior they were even less abundant. This compares to an average of 20.1 Red-eyed Vireo pairs per 40 ha on the Chippewa and 17.7 Ovenbird pairs per 40 ha on the Superior, the most common birds on each respective forest (Niemi et al. 2016). Since the BBS began in 1966, the Brown Thrasher has demonstrated a significant, steady population decline across its breeding range, averaging 1.04% per year (Sauer et al. 2017). Range-wide, biologists estimated the population has declined 37% since 1970 (Rosenberg et al. 2016). 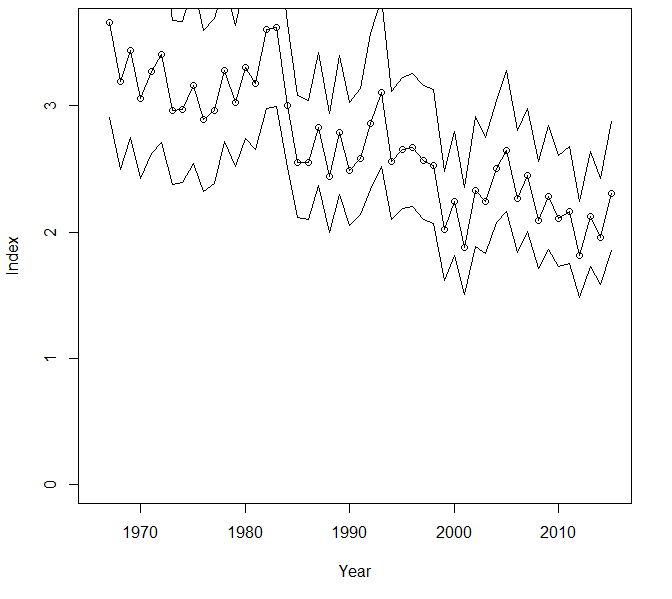 In Minnesota the species has experienced a similar trend, with a significant annual decline of 0.96% per year since 1967 (Figure 7). Maturation of shrubby habitats and young forests in eastern North America and more intensive agricultural practices that have eliminated fencerows and shelterbelts farther west are considered the principal factors responsible for the decline (Cavitt and Haas 2014). The loss of small family farms, for example, has certainly eliminated suitable habitat for Brown Thrashers throughout southern and western Minnesota. Between 2007 and 2012 the state lost 8% of its farms, a loss that was twice the national average (Pioneer Press 2014). At least one study suggested that the decline in thrashers observed in New York might be related to the significant increase in the number of Northern Mockingbirds, a more aggressive bird that could possibly displace the thrasher (Raynor 1976). Breeding population trend for the Brown Thrasher in Minnesota for 1967–2015 based on the federal Breeding Bird Survey (Sauer et al 2017). Although the Brown Thrasher remains a widespread species, the steady decline in numbers throughout much of its breeding range, coupled with threats to its breeding habitat, has prompted the assignment of a Continental Concern Score of 10/20 by Partners in Flight (Rosenberg et al. 2016) and its designation as a Minnesota Species in Greatest Conservation Need (Minnesota Department of Natural Resources 2015). A 2004 assessment of the thrasher’s response to warming temperatures predicted a northward population shift (Matthews et al. 2004), while the “State of the Birds 2010 Report on Climate Change” assessed its vulnerability to climate change as relatively low (North American Bird Conservation Initiative 2010). Although habitat loss is considered the most significant threat to the Brown Thrasher, its ground foraging habits increase its susceptibility to car collisions. Dead thrashers are also commonly found at the base of television towers (Cavitt and Haas 2014). In the short-term it is prudent to closely monitor populations to ensure that this widespread and common member of Minnesota’s avifauna, widely recognized for its diverse vocal repertoire, does not continue to suffer further declines. Bent, Arthur Cleveland. 1948. Life Histories of North American Nuthatches, Wrens, Thrasher, and their Allies. Smithsonian Institution Bulletin 195. Washington, DC: U.S. National Museum. Niemi, Gerald J. 1978. “Breeding Birds in Burned and Unburned Areas in Northern Minnesota.” Loon 50: 73–84. Raynor, Gilbert S. 1976. “Decrease in Breeding Brown Thrashers and Rufous-sided Towhees on Central Long Island.” Kingbird 26: 190–193.